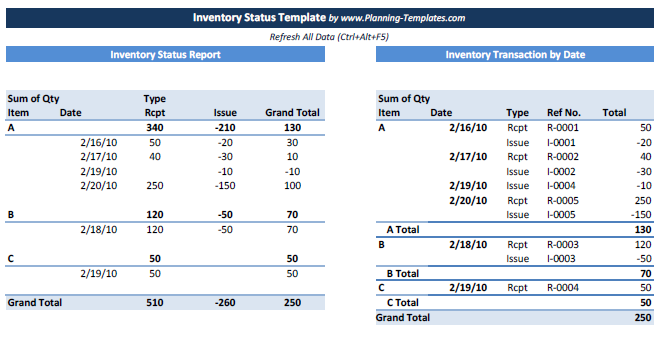 Inventory Status Template in Excel Spreadsheet : Track material receipt and issue and help you have more Visibility on Material Availability. Step 1 - Data Entry ( Receipt Date, Item, Receipt Qty, Ref No. ). Step 2 - Data Entry ( Issue Date, Item, Issue Qty, Ref No. ). Tip You can see inventory balance status as of required date in the past by tick off date after required date, for example, status as of '2/19/10' by tick off '2/20/10'.